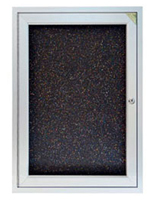 These cork boards incorporate a layer of high-effectualness acrylic, which is outstanding for offices, schools, and other high-traffic places. 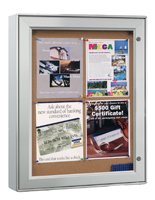 Because of its clear acrylic window, this cork board incorporates better visibleness while selling protection against meddling because of its break resistant quality. There's no need to worry about unwanted changes occurring. Your critical announcements are secure inside these cork boards! 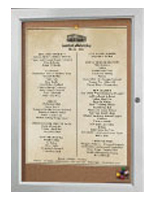 Display your announcements and community events in style with an cork board! With its Dark Bronze finish and matching Fudge colored mat board, this cork board adds elegance and sophistication to any indoor setting. 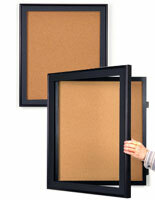 Exemplifying a special gravity latch and masked hinges, these cork boards are in a class all their own! 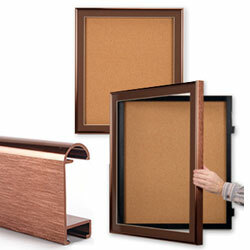 Mount your cork board, also called an information board, to the wall and you'll never have to take it down again! 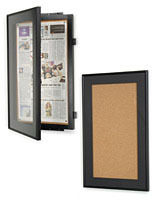 Once mounted, you can exchange your cork board with comfort! 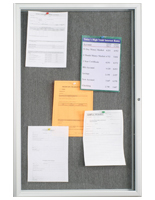 This cork board, dissimilar to other message boards, incorporates a special swinging frame. The swing frame permits for easier entrance to your cork display location, especially since the mat board remains attached to the acrylic window. 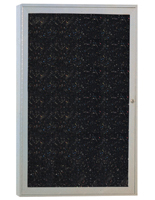 This cork board opens up to a full 90º, which renders changing your announcements hassle-free. To open the swing frame, slide your hand up the backside of the frame to release the gravity latch. When you've completed your changes, merely hold up the gravity latch while closing the frame until the latch falls into place. Your information board is now secure and secure once again. 21.5" x 27.5" x 2.3"